This Chandra image of the supermassive black hole at the Milky Way's center, a.k.a. 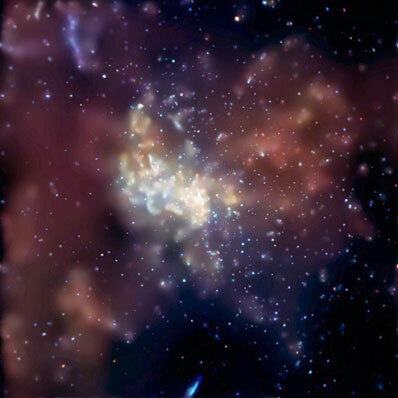 Sagittarius A* or Sgr A*, was made from the longest X-ray exposure of that region to date. In addition to Sgr A* more than two thousand other X-ray sources were detected in the region, making this one of the richest fields ever observed. Credit: NASA/CXC/MIT/F.K.Baganoff et al. The longest X-ray look at the supermassive black hole at the Milky Way's center has given astronomers unprecedented access to its life and times. The new data from NASA's Chandra X-ray Observatory revealed that our galaxy's central black hole is a frequent "bad actor," prone to numerous outbursts and occasional large explosions. The observations of the black hole, Sagittarius A* or Sgr A*, occurred over a two-week period with a total exposure time of 164 hours. During this time Sgr A* flared up in X- ray intensity several times. Astronomers also found evidence that suggests it had an even more boisterous past. These discoveries will help unlock the secrets of how Sgr A* grows and interacts with its environment. "We are getting a look at the everyday life of a supermassive black hole like never before," said Frederick K. Baganoff of the Massachusetts Institute of Technology (MIT) in Cambridge, Mass., who presented these new results on behalf of an international team at a press conference today at the American Astronomical Society meeting in Seattle. "We see it flaring on an almost daily basis," he said. The cause of the flares is not understood, but the rapidity with which they rise and fall indicates they are occurring near the event horizon, or point of no return, around the black hole. Even when it flares, the intensity of the X-ray emission from the vicinity of the black hole is relatively weak, which suggests that Sgr A*, weighing in at 3 million times the mass of the Sun, is a starved black hole. "Although it appears to snack often, this black hole is definitely on a severe diet," said Baganoff. "This could be because explosive events in the past blew away much of the gas from the neighborhood of the black hole," he explained. Indeed, evidence for such events, which astronomers are viewing 26,000 years later due to the time it takes light to travel to Earth from the center of the galaxy, can be found in the image. A faint streak of X-rays about one light-year long has been discovered 1.5 light-years from Sgr A*. The streak points at Sgr A*, suggesting the streak may be a jet of particles expelled at nearly the speed of light from just outside the event horizon of the black hole. The intensity and size of this jet indicate the flaring activity has been occurring for many years. On a much larger scale, huge lobes of 20-million-degree- Centigrade gas, extending over dozens of light-years on either side of the black hole, have also been discovered. "These lobes show that enormous explosions have occurred several times over the last 10,000 years," said Mark Morris of UCLA, lead author of a second paper on Sgr A*, who also participated in the press conference. Sangwook Park, of Penn State University, University Park, Pa., and Michael Muno, of MIT, were lead authors of two other papers presented at the meeting. These papers focused on the extraordinarily rich region around the central black hole, where they detected more than 2,000 X-ray sources.